Following the hearing held on May 22nd regarding the request by GCU to obtain an academic licence for its New York hub, a set of recommendations have been issued to the New York State Higher Education committee that will meet this month ‘where it will be voted on and action taken. It will then come before the full Board at its June 2017 meeting for final action’. In the report, available here in a downloadable pdf, the department summarises the University’s case, and those of the objectors to GCU’s request. “GCNYC expects its year one enrolment across programs to be 40 students, split evenly between full-time and part-time students, and for enrolment to grow steadily each year. GCNYC’s expected year five enrolment is 118 full-time and 98 part-time students across all programs”. “The Department completed its initial review of GCNYC’s submitted proposals and has determined that the proposed programs meet the standards for registration (including those related to financial resources, faculty qualifications, curricula and awards) should the Board decide to grant a provisional charter”. GCNYC does not demonstrate actual need for a new degree-granting institution. GCNYC seeks to offer programs in a marketplace that is demonstrated to be already saturated with similar programs. (NYS institutions posit that GCU’s claims of need are not valid or remain unsubstantiated). GCNYC as an institution, and its proposed programs, are duplicative and in direct competition with several existing New York State institutions and their programs. The presence of a new institution would drain or diminish resources available for existing IHEs and negatively impact their operation. Granting a foreign institution degree-conferring authority as a NYS college which could ultimately allow it to access state and federal taxpayer monies would be precedent-setting, and could potentially open a floodgate of similar applications. 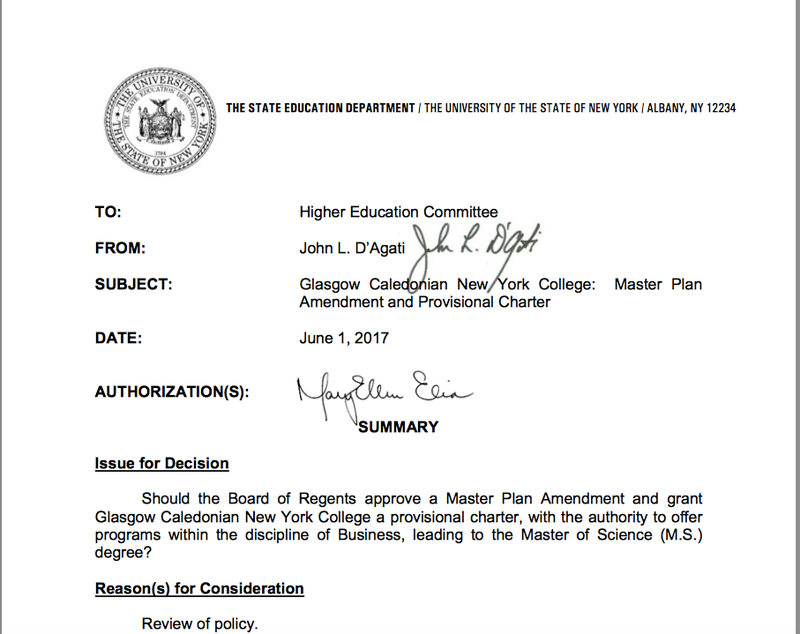 VOTED: That the Board of Regents approve a Master Plan Amendment and grant Glasgow Caledonian New York College a five-year provisional charter, with the authority to offer programs in the discipline of Business, leading to the Master of Science (M.S.) degree. If the Board of Regents votes to adopt Option 1, GCNYC’s applications for a provisional charter and a master plan amendment will be permanently closed. If the Board of Regents adopts Option 2, the Department will issue it a provisional charter for five years and will register GCNYC’s programs. Pursuant to §3.22 of the Rules of the Board of Regents, during the term of a provisional charter, GCNYC would not have the authority to confer degrees and the Board of Regents would confer degrees to students who complete registered programs at GCNYC. GCNYC must apply to the Department for an absolute charter and authority to confer degrees at least 18-months prior to the expiration of the provisional period. At that point, the Board of Regents will make a determination on whether to grant GCNYC an absolute charter and authorize GCNYC to confer degrees or extend the provisional charter, or deny GCNYC any charter authority past the term of provisional authorization. If GCNYC does not apply for an absolute charter with the authority to confer degrees at least 18-months prior to the expiration of the provisional period, the provisional charter will expire at the end of its term. GCU management has not yet given an opinion of this, but it is expected that the full Board of Regents will meet to decide the issue on June 16, and that Court, with whom responsibility ultimately lies, will consider it the full decision at its meeting on the 22nd June. This entry was posted in Uncategorized and tagged GCU NY, Governance. Bookmark the permalink.